Until last week, I had never even tasted a madeleine, much less made them, but I agreed to make some for a baby shower, so I set to work! Peabody is a great resource for pretty much any delectable baked good, so I looked there first. I also had in the back of my head that I'd like to use meyer lemons, since I had just bought some from Trader Joe's. 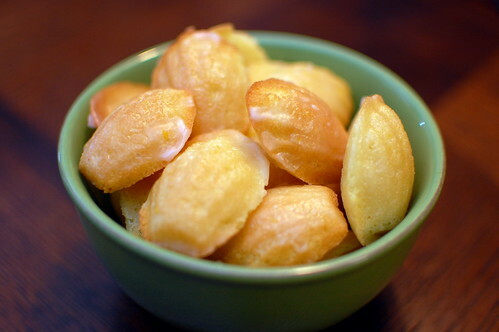 Lo and behold, she has a recipe for Meyer Lemon-Glazed Madeleines! They aren't terribly difficult to make, you just have to be careful not to overfill the molds or overmix the batter. And the glaze is so tasty, I could probably drink it! In case you've never had a madeleine either, they are little shell-shaped cookies that are actually delicate little cakes. So pretty! I loved using meyer lemons - they are sweeter than regular lemons, but still retain a bit of tartness, and not as sweet as oranges. These were so fun and pretty, and I can't wait to try out some different variations! Brush the Madeleine mold with melted butter, then lightly coat with flour. Shake off the excess and place the mold in the refrigerator. Zest the lemon into the melted butter. Using an electric mixer, beat the eggs, sugar, and salt until thickened and frothy, about 5 minutes. Combine the flour and baking powder, and sift into the egg mixture, folding as you go with a rubber spatula. Mix until just combined. Drizzle the melted butter/lemon zest into the batter, a few spoonfuls at a time, folding gently. Again, mix until just combined, and be careful not to overmix. Refrigerate the batter for at least 1 hour, or overnight. Preheat the oven to 425. Use a teaspoon to drop the batter into the Madeleine molds, filling each one 3/4 full. Do not spread, the batter will spread as it bakes. 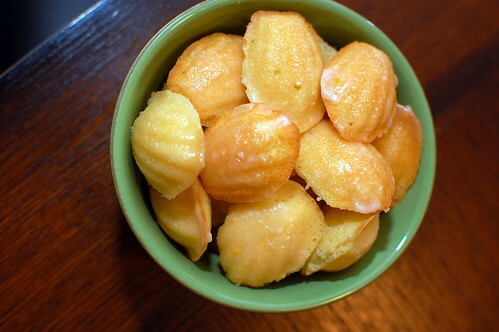 For mini madeleines, bake 5-7 minutes, for standard madeleines, bake 8-9 minutes, or until the cakes feel just set. As they bake, whisk the powdered sugar, lemon juice, and water together to make the glaze. Gently remove the madeleines from the mold using a spoon, and cool on a cooling rack. After they have cooled about 3-5 minutes, dip the scalloped side in the glaze, and return to the cooling rack to cool completely and set the glaze. They are best eaten the day they are made, but can be stored overnight loosely covered. ooo, these look good! my parents have a meyer lemon tree and always offer me some when they are in season. Madelines are such a pretty cookie. I've always wanted to make them, but I have yet to try. Those look like perfect little cookies and I bet that they were very much enjoyed at the baby shower. Oooh I love anything lemon! These look perfect for a baby shower! These are gorgeous madeleines you've made. I got a madeleine pan for Christmas and have yet to try it out. I've just been waiting for the right recipe to happen by! This looks like a perfect candidate. Lovely! Your madelines are so pretty - they look gorgeous! I agree about the glaze - dangerously delicious!